You can also find a very simple example I wrote here. This example does not restore the memory but only the CPU context and is meant to be run on this specific program. However, it still shows the very basics of creating a checkpoint and restoring it using PIN. Pay attention to the use of PIN_ExecuteAt and PIN_SaveContext for the creation and then restoration of the checkpoint. Note that these two APIs only save the CPU context and not any other part of the program context. Well, that's it for the intro. Time to get down to business. The following notes are meant to highlight potential performance savings and pitfalls. The scenario discussed here is a program that reads some input file and we want to fuzz this file input. What memory to save / restore? Collect the information on the relevant memory areas via memory access tracing. You can find an example tool that does memory tracing included in the PIN kit. After you run several representative workloads you should have a pretty good understanding of what memory areas you need to save and restore. Use the memory tracing approach in real-time (slower but more accurate). i.e. save all the addresses modified between the save point and the restore point and just restore those to their original values. Just save and restore all writable program memory - this is not recommended for programs using more than a few MB of memory. Please note that there will usually be some memory areas that you can ignore restoring because those will be overwritten by the next file you load. A final note on saving and restoring - due to performance considerations you should strive to save a copy in RAM rather than saving anything to disk. Modifying the pointer to the string - changing that pointer to point to a string allocated from your pintool. The consumption of system resources is one of the biggest problems you'll face when fuzzing like this. That depends greatly on your choice of where to locate your restore point. For example say you are fuzzing MS-Word. A restore point chosen after you close the file should not require any freeing of resources to be done by you (that is because MS-Word is supposed to handle this automatically). On the other hand, if you choose to restore immediately after completing the load of the file because the actual unload is not of interest for your fuzzing project then the responsibility to free the system resources falls on you. It is fairly easy to just hook the allocation functions for those resources and save the details then free those once before we restore to our checkpoint. I highly recommend considering your restore point carefully and considering the option that you missed freeing some resource when debugging the first couple of crashes you get from this. Bug chaining is a high possibility using this technique so verify several test cases back if you get a result which doesn’t repeat without PIN. It might be that in some cases you need to save less than all the context (my example saves all context). It is possible to do so to save overhead and then just modify IP using the proper PIN API. The first test cases will appear slow, that is to be expected and because of JITing. If you stop the fuzzing and restart it you have to pay the JITing overhead again. Don’t forget to log things like the current fuzz file name to somewhere outside the process you're fuzzing. If you use a log file make sure to flush it. While it seems trivial it is very easy to miss a test case like this. Well, that's it for today. If you have practical questions or comments feel free to leave those. Hey, what's the difference between your fuzzer and an in-memory fuzzer? The in-memory fuzzers I saw so far usually belong to the simplest answers in these categories. there is one more distinction you can add, whether your fuzzer "honors" the program filters or not. 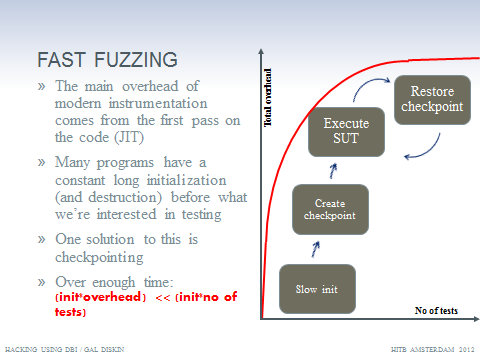 That being said, regardless of how you call it, my main purpose here is to provide notes on the pitfalls you'll face in implementing such a fuzzer. With regards to the "what memory to save/restore" question, is there any value to making use of Copy-on-Write OS capabilities when feasible? Or would forking cost more than its worth?